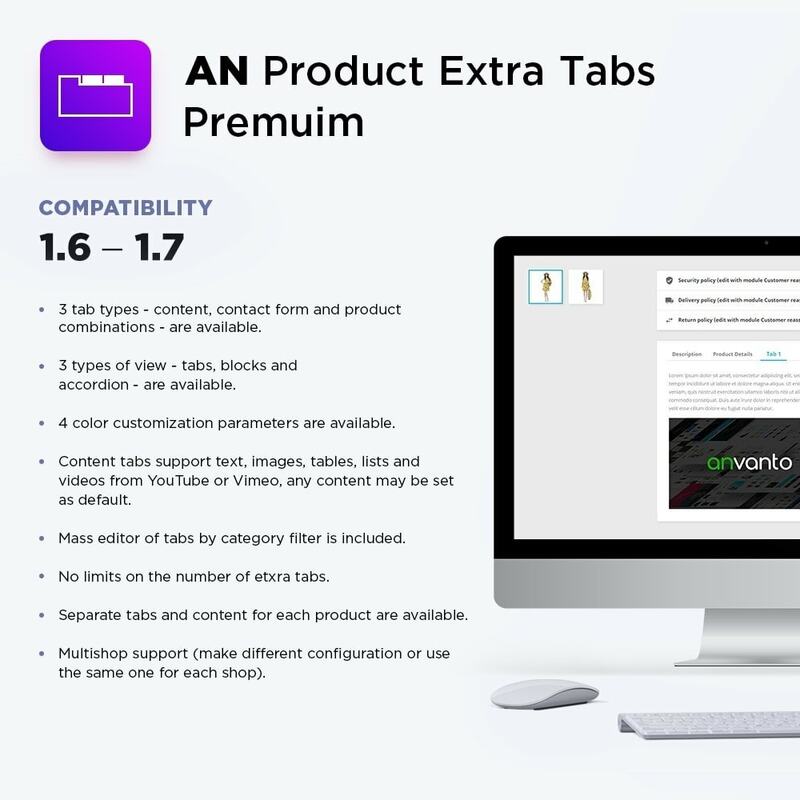 Give a user extra product info with AN Product Extra Tabs Premium. 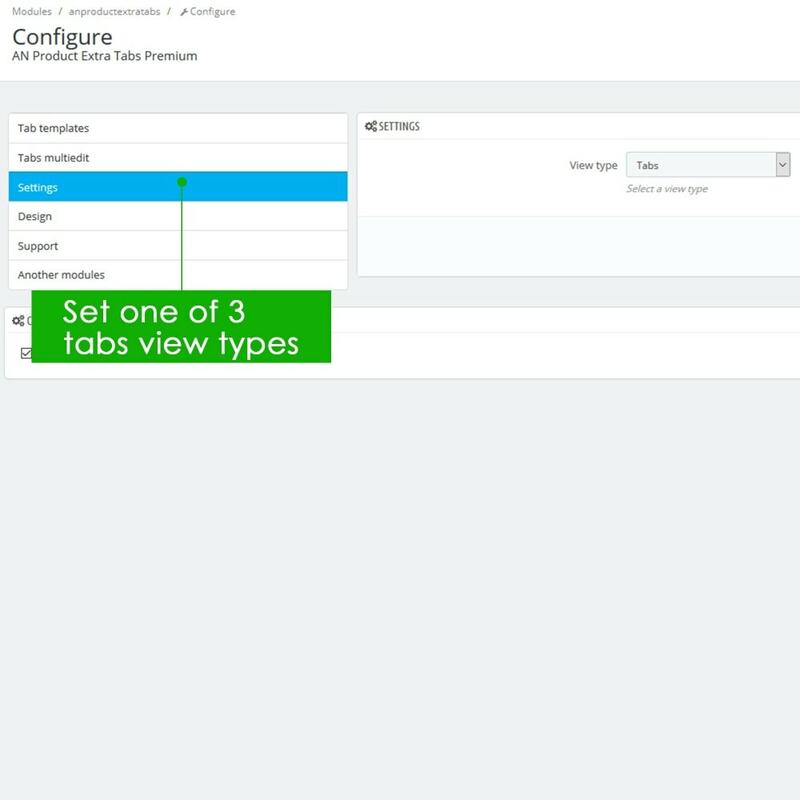 Create additional description tabs with any format of content – tables, instructions, YouTube or Vimeo videos, cases, looks, reviews etc. Too few default description tabs? Create any quantity of additional ones. Is there the same text for each product? 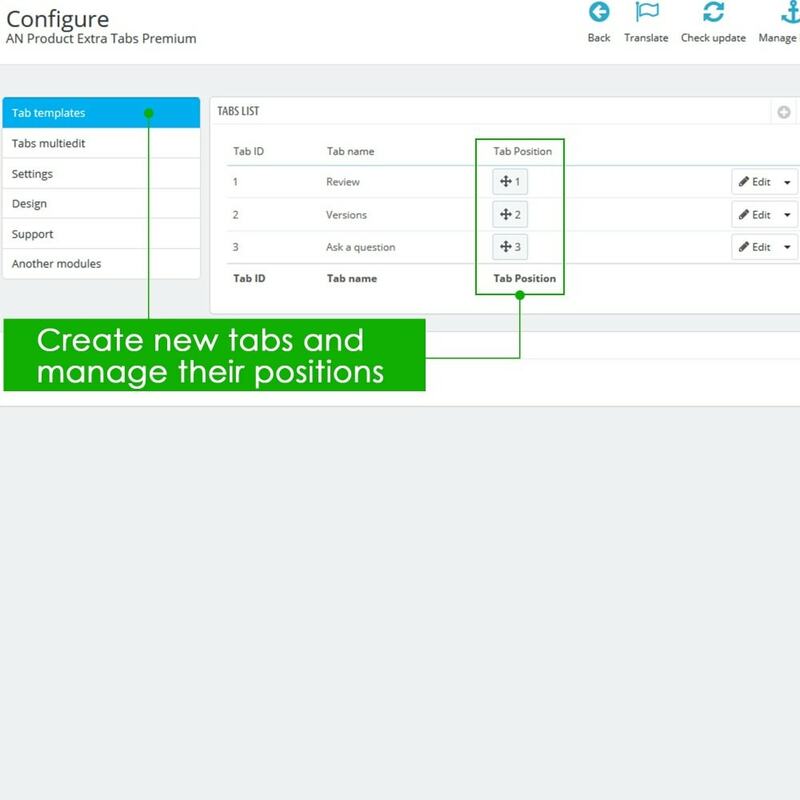 Make default text in created tabs for 1 time. 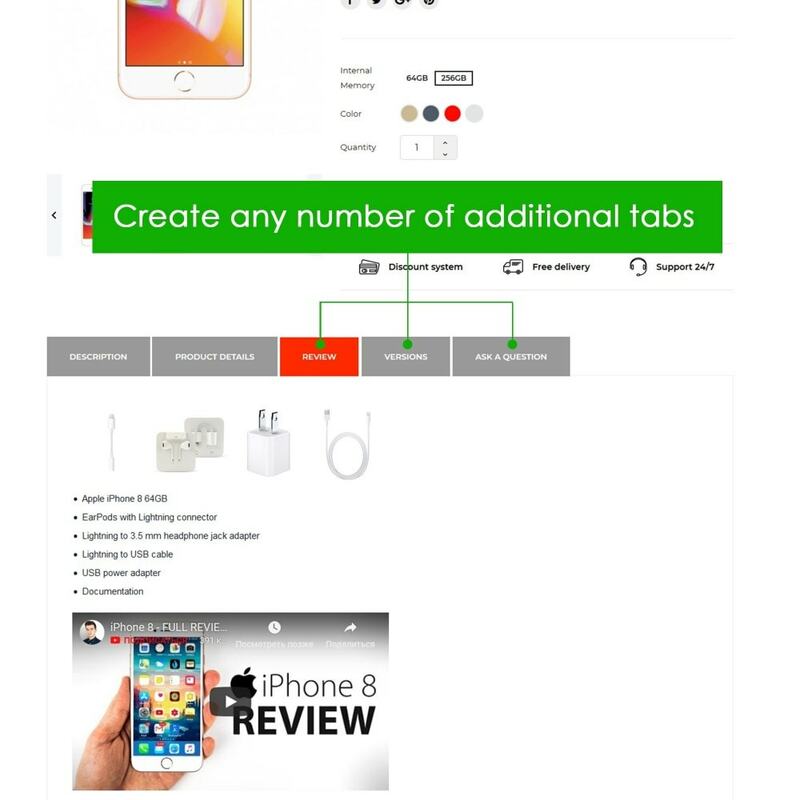 Add useful information for users (instructions, conditions of use, looks etc.) 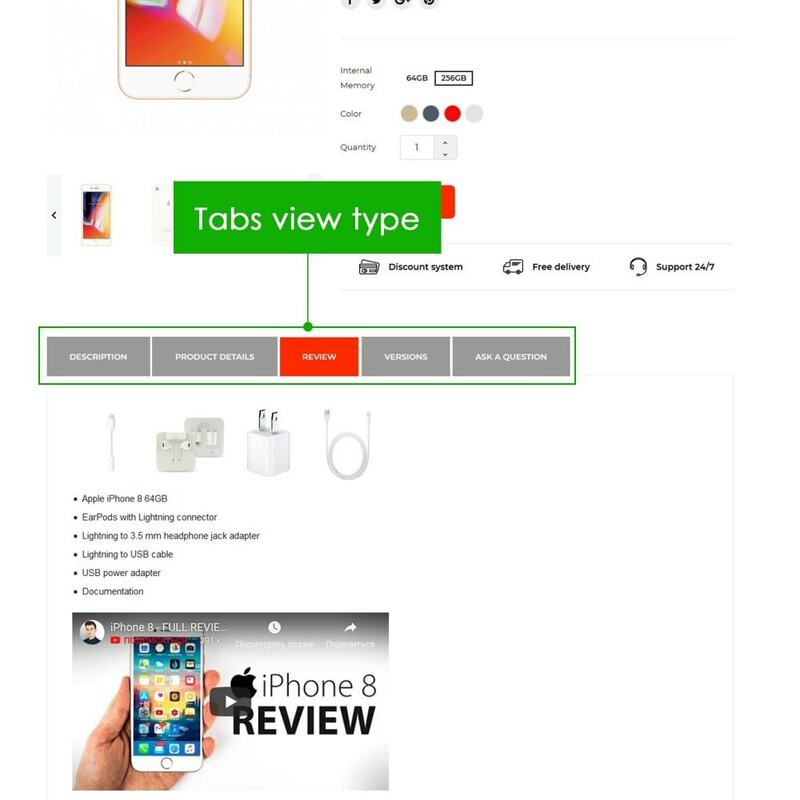 not by making a huge description, but by creating a structured description with tabs. Help users to easily ask a question with a contact form in the special tab. 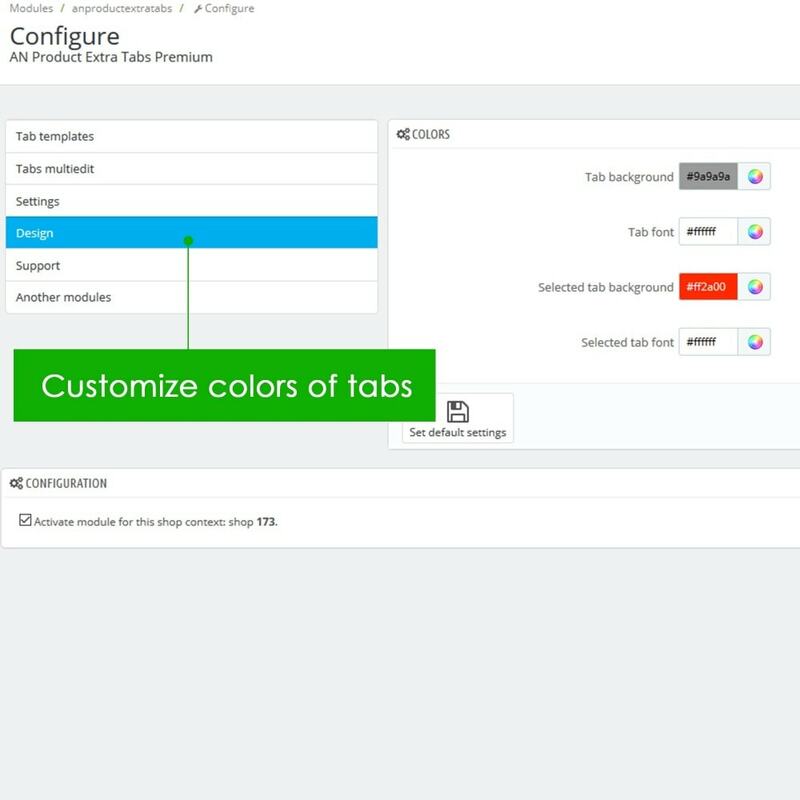 Create possibility to vew all product combinations, their prices, quantities etc. in the special tab. 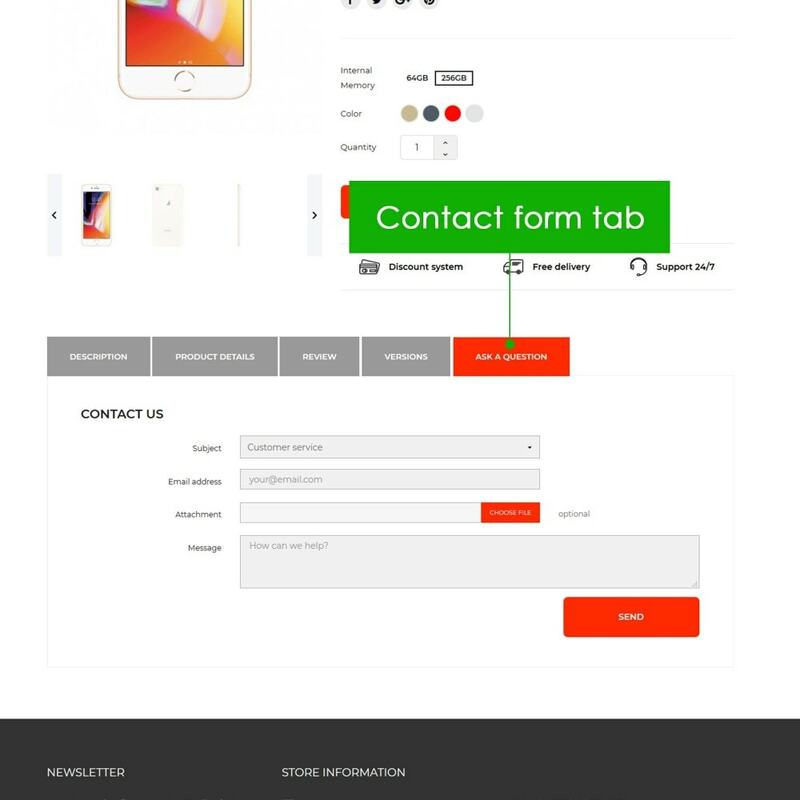 3 tab types - content, contact form and product combinations - are available. 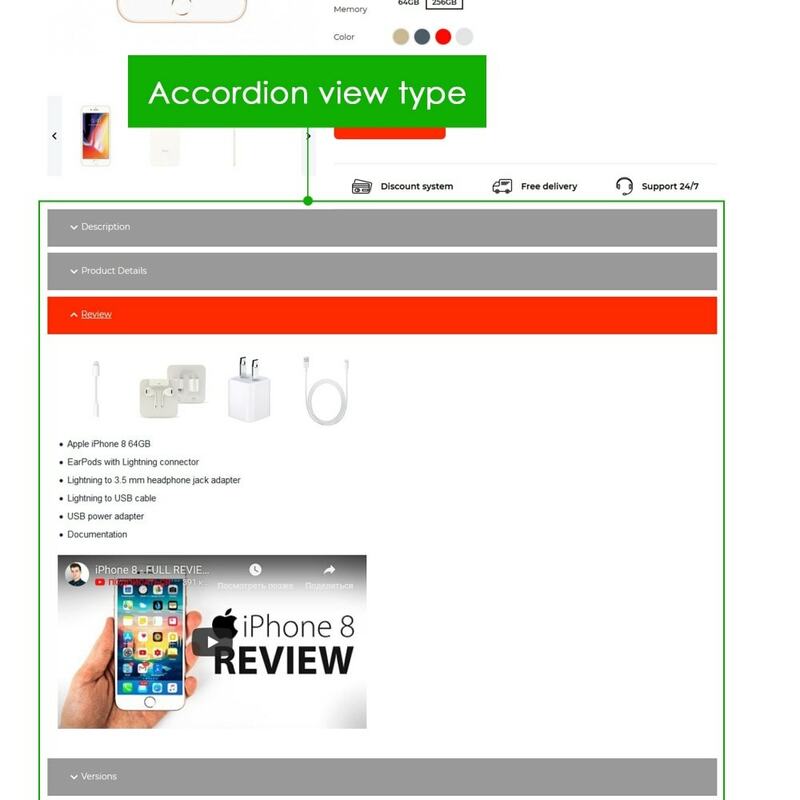 3 types of view - tabs, blocks and accordion - are available. 4 color customization parameters are available. 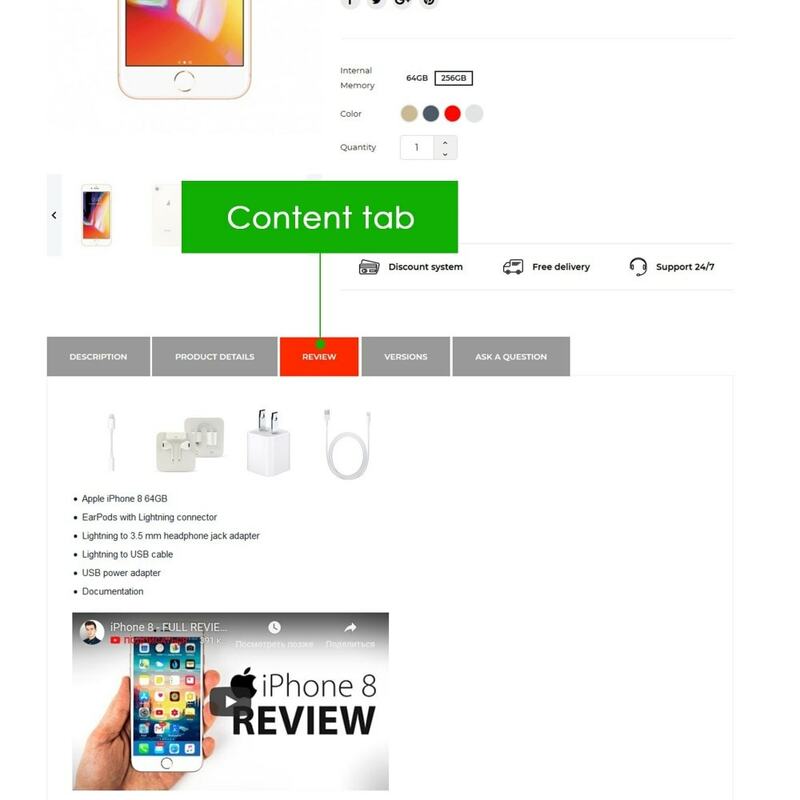 Content tabs support text, images, tables, lists and videos from YouTube or Vimeo, any content may be set as default. 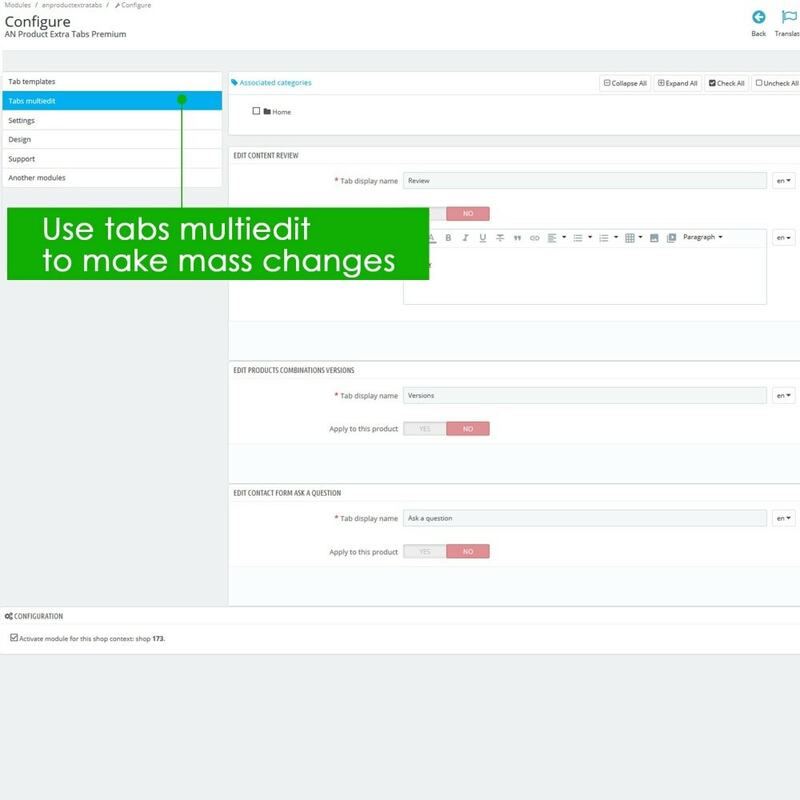 Mass editor of tabs by category filter is included. No limits on the number of etxra tabs. 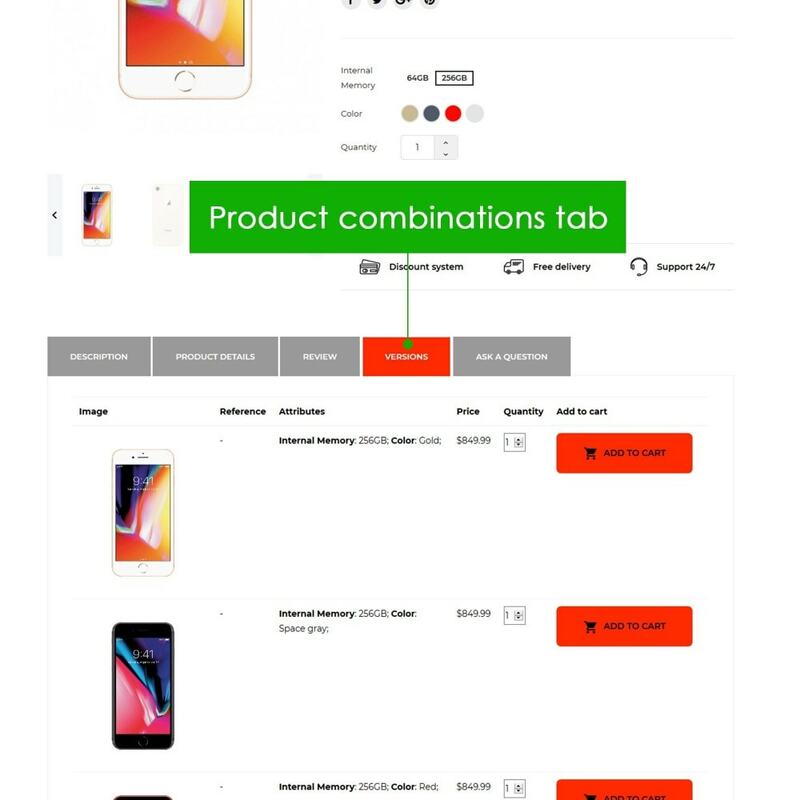 Separate tabs and content for each product are available. Multishop support (make different configuration or use the same one for each shop). Zmień sposób obliczania kosztów wysyłki, wykorzystując jako odniesienie ostateczną kwotę zapłaconą przez klienta (mniejsze zniżki). Nie stosuj bezpłatnych kosztów wysyłki, jeśli klient nie osiągnie skonfigurowanej minimalnej kwoty. 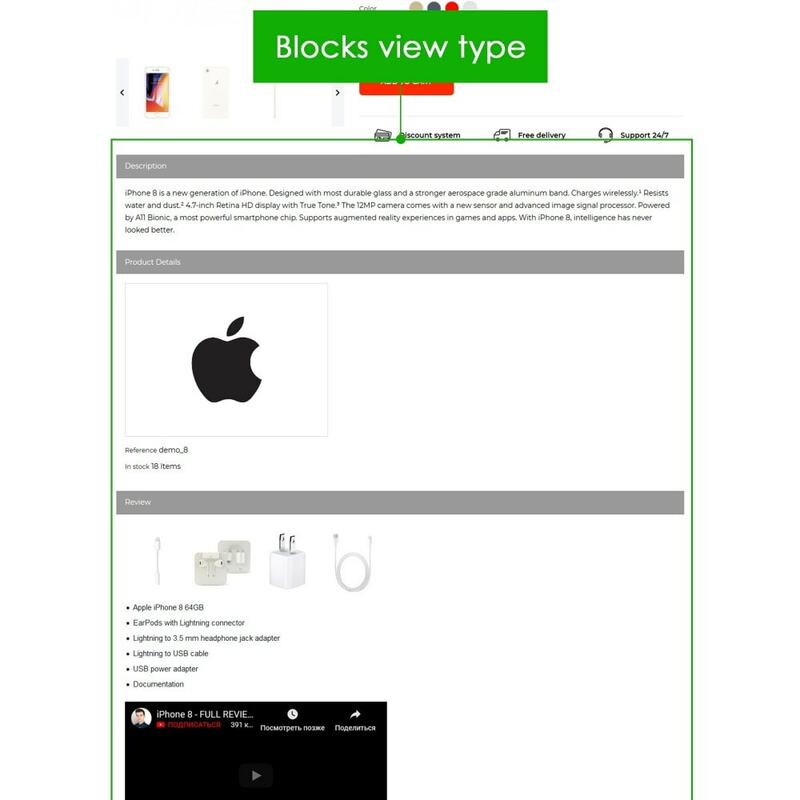 Clients can see useful and structured product information to make a purchase.